Jonathan Mizzi spoke to TVM News about the studio’s proposal to give a “technological twist” to the fleet of traditional Maltese buses. Designboom has published Mizzi Studio’s designs for an “all-electric comeback” of Malta’s iconic buses. Jonathan Mizzi spoke to Forbes’ Nargess Banks about our Malta Bus Reborn project. Banks says, “Mizzi Studio is bringing love and life back to the traditional Maltese bus”. Malta’s Minister for Transport & Infrastructure, Ian Borg, said: "Mizzi Studio’s new bus design proposal is phenomenal. The idea of having an electric fleet of buses that is so reminiscent of the iconic traditional Malta Bus is something we look forward to studying further together with this talented team of designers." Mizzi Studio’s designs for a new fleet of Maltese buses have been featured by Wallpaper*. Jonathan Bell describes the new buses as “boldly styled and unapologetically art deco in influence”, combining visual charm with zero-emission technology. Lovin Malta launched the first edition of its new weekly print edition, Lovin Tomorrow - or did it? The paper was later revealed to be an April Fools prank, but all the stories were 100% true. No fake news! And the headline story was Mizzi Studio’s designs for a new Maltese bus fleet. Mizzi Studio has designed a new electric fleet of buses for Malta that marries zero emissions technology with all the character of the iconic traditional Maltese buses that were retired in 2011. Through our contemporary, eco-friendly reimagining, we hope to ignite a renewed sense of pride in Malta’s industrial and cultural heritage. Anylab visited our London studio to talk to Jonathan Mizzi about Mizzi Studio's project to transform London's Royal Parks, and the future of the built environment - from high tech architecture to the impact of autonomous vehicles. ELLE Decoration’s April issue features the first of our Royal Parks kiosks, and highlights the flagship brass kiosk that will open in July. Jonathan Mizzi spoke to eporta about the studio’s project to transform ten sites across London’s Royal Parks, and why design matters for our cities’ green spaces. At the Malta Innovation Summit 2018, Jonathan Mizzi shared his innovative approach to enhancing the physical world through biomimicry and a fusion of traditional craft and the latest digital techniques. Jonathan Mizzi recently shared his favourite London galleries, homeware stores and secret spaces with the Evening Standard. 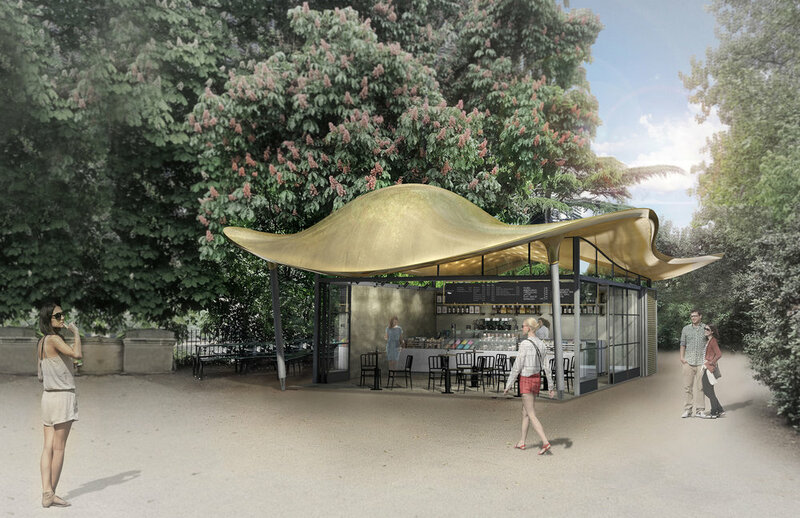 We have reached an exciting milestone in our project to transform London's Royal Parks with a family of nine new sculptural kiosks. The first kiosk, clad in steam-bent oak, is now open at Ritz Corner in Green Park. Mizzi Studio has unveiled its second commission for a Westfield site – a new beauty bar at the entrance to Westfield London’s £600 million expansion. Mizzi Studio was honoured to be one of five previous award-winning designers who were invited by the Restaurant & Bar Design Awards organisers to create a huge three-dimensional tapestry on the theme of 'celebration’, to mark the 10th anniversary of the awards. Our design was theatrically revealed during the ceremony in Kings Cross, London in October 2018. 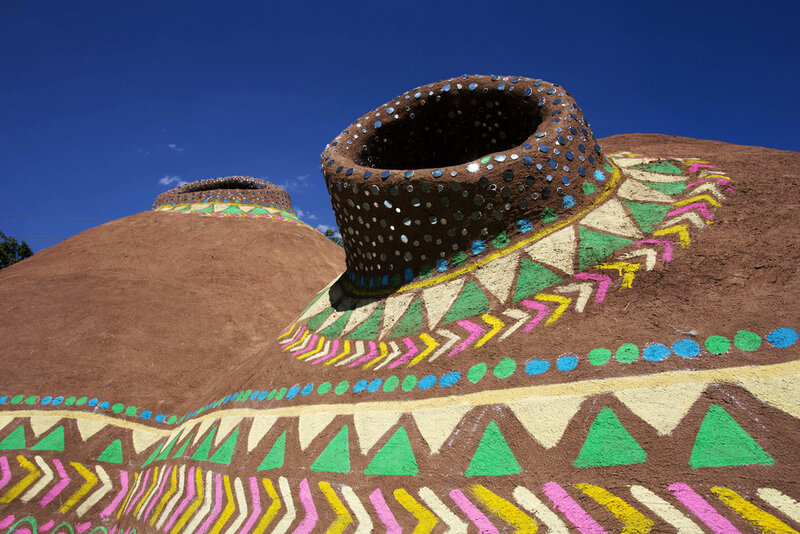 VOGUE counted the hand-made Holi mud huts, designed by Mizzi Studio, among 10 things they loved at Holi Saloni.